As animal advocates continue to work tirelessly to save dogs from puppy mills, we keep seeing the end result through undercover investigations, adoption campaigns, large-scale seizures and mass rescues of dogs who were lucky enough to be saved. Now a new feature-length documentary, Dog by Dog, has gone further to expose how an industry that continues to abuse and exploit man’s best friend in a nation of dog lovers has been able to continue to successfully stay in business. The story is told by Chris Ksoll, a banker who got involved after fostering a former mill dog and Christopher Grimes, CEO of 5414 Productions, who investigates the money trail they believe leads to 2 to 4 million dogs being purchased from mills every year. They expose the involvement of agribusinesses that have nothing to do with dogs, including Monsanto and Smithfield – the nation’s largest pork producer – that are stepping in to block any meaningful change for our canine companions. Their interest in thwarting these efforts, many believe, is that if we get change for dogs, we’ll come for their pigs, chickens, goats, sheep and cows next and better standards for animals mean more work and lower profits for them. The sad reality for these dogs, is that despite the efforts of animal advocates, there are still an estimated 10,000 puppy mills across the U.S. that are relentlessly churning them out. As the Humane Society of the United States just noted with the release of its Horrible Hundred list of worst mills, this isn’t an issue that affects any single area or state, because these dogs end up for sale all over the U.S. The film’s creators say in the director’s statement their hope is that the information they’re bringing to light will help us make the world better for dogs by changing both the way we vote and buy dogs. The film, which just made its world premiere this month in New York City, will continue to be shown at screenings across the country in coming weeks. For more info, check out Dog by Dog. Agribusiness and the USDA are a worse horror than ISIS. The politicians of course will help any mafia, any terrorist group, if it involves their kickbacks. I will never understand how the USDA has any business having pets under the same regulations, (or lack thereof), as poultry, slaughter hogs and beef cattle....WE DO NOT EAT DOGS AND CATS IN THIS COUNTRY! They are our pets and to some, our babies! Our government must stop allowing them to be mass produced like they were food animals! And the conditions that we accept as "USDA approved" for these animals to live in, consist of a lifetime of horrific neglect and deprivation! These pets don't even get to go to slaughter when they are old enough and fattened up. 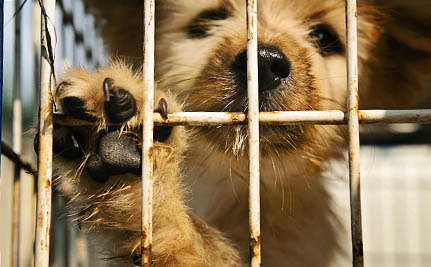 They live their entire lives in a cage, often left out in all kinds of weather, with little or no veterinary care. The female's' life is spent carrying, nursing, or grieving her lost babies, until she is bred yet again. Then about twice a year, the male shares her cage until mating is complete. Then he is returned to languish in his own filthy cage until it is time to breed again. This only ends for them when they die, or become "no longer good for breeding". Then they just let them loose in the woods to starve or be killed by a wild animal, or eventually get picked up as a stray, which floods our shelters. What happens to the others is unknown. I don't know what, if any regulations exist for their "disposal," but dead animal carcasses have been found on the property of some of these mills. Many blessings to all who work to make animals' lives better. We are their only voice. So I am using my voice to post this repeatedly, until it somehow falls into the hands of someone who has the authority and the courage to help us put an end to puppy and kitten mills forever. We will euthanize thousands of pets today at our animal shelters and city Animal Care & Control facilities. We will euthanize thousands of pets tomorrow too, and most every day. Unless our lawmakers put an end to the mass production of puppy and kitten mills, this pet overpopulation crisis is doomed to increase. We will never be able to "rehome." adopt, spay/neuter or even euthanize our way out of this crisis as long as these mills are churning out pets like they were food animals. This is costing our government millions of tax dollars, which are OUR TAX DOLLARS! And they are being spent to kill pets that the mills are producing. This is a vicious circle that never ends and has become a wasteful sinkhole of our tax revenues that could be better spent elsewhere. The USDA has neglected to regulate this mill production, to the point that we are glutting our own tax system. Our government must know that this can not continue. We The People must demand that our lawmakers vote with us, and not with the Ag Industries, to STOP THIS INSANITY!